Is the kitchen the heart of your home? A communal hub of romantic dinners, Sunday lunches, and feasts with friends? If so, make this the year you give this essential space the love it deserves. Kitchen renovations come in all sizes, meaning they can suit all kinds of budgets. To get you in the mood for transforming your space, we’ll share some of our favourite projects from the last year - plus offer some handy tips! We love this kitchen for bringing together all the benefits of a modern design, but also the charm of those beloved country kitchens. This old home charm is created through those gorgeous hardwood floors, which have been given a rustic coat of white paint. The imperfections in the boards have a lovely stylistic effect, and brings character to the whole space. Keen interior design fans might notice some other classic English staples, such as the butler sink, an AGA style cooker, and the mismatching dining furniture. If you wanted to create a similar effect, combining modern and antique furniture would be a good call - not to mention a fun project. When designing this space, our team kept the actual structure of the building rather contemporary. We added in skylights to stop the kitchen getting too dark (some period features are best left in the past), and we installed those large crittall style doors. The metal frames in keeping with the unique character of the rest of the kitchen. The cool tones in this kitchen help make this the perfect chill zone for those lazy mid-week dinners. Alongside this, these homeowners certainly have good taste in modern trends. The geometric lines of their kitchen island is a wonderful quirk, and who wouldn’t be jealous of that double oven set up? While putting this space together, we wanted to help add some order to the open-plan layout. Allowing the homeowners to separate the space into different areas. This has been partly achieved through that jaw-dropping glass ceiling, which helps create a well of light for a social area. Combining this with the exposed brick wall, the whole kitchen gets a new level of depth. Those of you with keen eyes might be able to spot the other special feature in this space, which is the small log burner at the back. This takes the sitting area to whole new level of cosiness! What we love most about this space is that this family isn’t afraid to have some fun with their kitchen diner. Can you spot the fun they’ve had? Over in the corner, they’ve added in their own hanging chair. And who can blame them? Our designers went out of their way to incorporate the largest doors possible, so none of those gorgeous garden views went to waste. We also landscaped the garden to help make the transition from inside to outside as seamless as possible. Meaning they can get the most of their home during those hot summer months. And speaking of the sun, we dotted in skylights along the roof, to bring in extra light. These work wonderfully, even with those support beams in place. And all this added light helps highlight more of the home’s quirky touches. From the log wall, to the more subtle touch of having the marble countertop run up onto the wall. This is truly a one of a kind home hub! We love this space, as it proves that sometimes less is more. They took the long line of skylights we added, plus some wide bi-fold doors, and utelised the light with bright white decor. To give it that fun touch, pops of colour are made throughout the home. In the kitchen, the bright yellow lampshades bring enough POW to become the statement pieces of the whole space. We especially love how this homeowner has complimented them with a bowl full of lemons and oranges. Towards the back of the home, you’ll be able to spot the cosy sitting room that’s been set up next to the even cosier patio section. We’re sure those rainbow cushions help brighten up even those grey winter days! We love this last kitchen for the way they’ve matched so many different materials into one space. Concrete style floors, timber furniture, tiles, the steal on the windows - so many colours and textures, all blended to perfection. 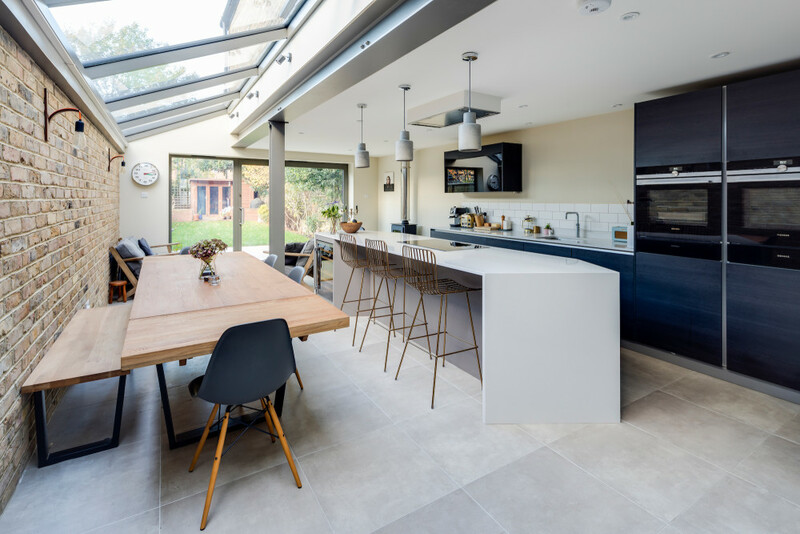 This kitchen was renovated through a rear extension, but our designers did encounter some challenges when it came to planning. Because of neighbours and concerns on overshadowing, our team staggered this space. This is why there’s a small L towards the back. However, this just further adds to the unique charm of the place, and has been turned into a small reading nook - adorable! Want to discover your renovation options? Book in a free consultation with our team.